If you're looking for a little more air flow we carry a very similar CleanFreak® high speed quick drying air mover, which has 2800 CFM, and only pulls 5 amps. 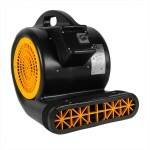 For other designs and models, make sure to look through all of our air moving carpet dryers. 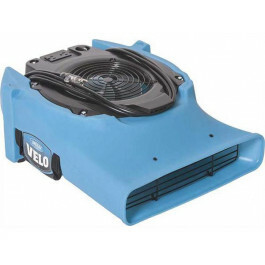 The Velo Pro has the same slimline design as our Vilo F504 Low Profile Airmover with addtional valuable features including precision variable speed control which allows up to 10 units on one 15-amp circuit. Other included options are digital amp readout and a built-in kickstand. Like the Velo (F504), the Velo Pro (F505) delivers high velocity air movement, ultra-low amp draw and AMAZING portability – it's 25% shorter than other compact units and weighs just 21 lbs. Dri‑Eaz combined these features with a quick‑to‑disassemble design for easy cleaning, 5‑position versatility and legendary U.S.-made quality to make the Velo Pro one of the best Dri‑Eaz air movers ever built. Only pulls 1.9 amps per fan, allowing you to plug up to 6 fans into 1 outlet. Tough polypropylene shell withstands abuse and is lightweight. Versatile structure allowing to dry floors, ceilings, stairs and walls a breeze. Low profile having a height of 25% less than competitive models. Unit is stackable, up to 6 units high, for storage & transport. Lightweight of only 21 lbs. This is a review for the Dri-Eaz® Velo™ Low Profile Air Mover.